The imagePROGRAF iPF9400 Built to put advanced printing technologies into the hands of artists and photographers, the 60" iPF9400 will help to fulfill your creative potential like never before. This large format printer incorporates a 250GB hard drive, 60 inch borderless printing and the LUCIA EX inks for exceptional prints. The new Multi-Sensor included with this printer provides improved color density detection and allows for a full calibration to be completed within 15 minutes. To expand printing options and capabilities, the iPF9400 printer comes bundled with a Print Plug-in for Adobe Photoshop, Digital Photo Professional, and Microsoft Office. The enhanced Print Plug-in for Adobe Photoshop includes a new Adjustment Pattern Setting which allows for multiples of an image to be printed at once with different color values implemented and displayed. Gallery wraps for canvas prints can now be created using the new Gallery Wrap Feature. To improve versatility, the iPF9400 has a media configuration tool which allows customers to not only utilize existing Canon-branded media, but also with third party media. 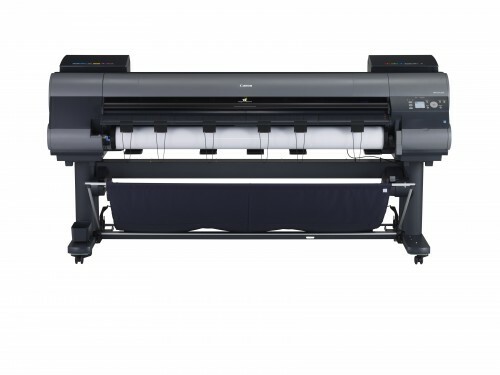 Designed for efficiency, reliability, and above all quality, the iPF9400 is the professional's answer to superior quality large format prints.